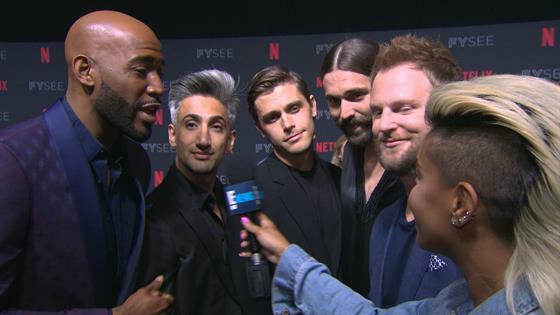 The new Queer Eye Fab 5—Karamo Brown, Tan France, Antoni Porowski, Bobby Berk and Jonathan Van Ness—just want to help. They're not here to judge you. Fans asking for makeovers, and in Bobby's case asking for home makeover tips, are always approaching the Fab 5 on the street. "I get pictures of rooms all day long," Bobby told E! News' Sibley Scoles at Netflix's FYSee event. "‘What color should I paint this? What wallpaper should I use?'" "Whenever I meet somebody they're always nervous I'm going to judge their outfit," Tan admitted. "I'm really not judging your outfit. I promise you, I'm not." "Can we get that out there? People are always nervous thinking we're going to judge them," Karamo added. "We're the least judgmental people." "We're there to help," Tan said. "We're there to help, we don't judge," Karamo echoed. "We're going to find what's beautiful about you and lift you up." Fans were initially cautious about a Queer Eye reboot. The original series captivated the nation and made that Fab 5 into household names. But the reboot didn't miss a beat. "It's an homage show," Antoni told us. "And I think with this it's apples and oranges. It's taken on a whole new meaning on its own with a home like Netflix where it's not advertiser dollar driven, we really get to focus on the story. That's only helped us." "They really gave us the creative control to make the show our own," Bobby said. They didn't say, ‘We want you to go in and do Queer Eye exactly like it was done,' they were like, ‘We want you to go in and make Queer Eye for now.' And I think they really allowed us to do that." Click play on the video above to hear more from the cast, including a special appearance from Gloria Allred. The cast will return for a second season of Queer Eye.